surprisingly, rodney alexander and steve scalise voted nay. see house roll call vote 519.
buried inside H.R. 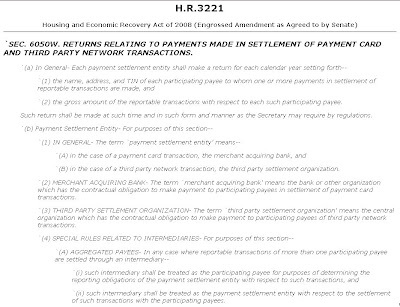 3221 known as the foreclosure prevention act of 2008, sponsored by nancy pelosi is sec. 6050w. 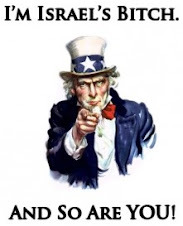 TITLE III--REVENUE PROVISIONS >>>> Subtitle B--Revenue Offsets >>>> SEC. 3091. RETURNS RELATING TO PAYMENTS MADE IN SETTLEMENT OF PAYMENT CARD AND THIRD PARTY NETWORK TRANSACTIONS. >>>> SEC. 6050W. RETURNS RELATING TO PAYMENTS MADE IN SETTLEMENT OF PAYMENT CARD AND THIRD PARTY NETWORK TRANSACTIONS. Payment Card and Third Party Network Information Reporting. The proposal requires information reporting on payment card and third party network transactions. Payment settlement entities, including merchant acquiring banks and third party settlement organizations, or third party payment facilitators acting on their behalf, will be required to report the annual gross amount of reportable transactions to the IRS and to the participating payee. Reportable transactions include any payment card transaction and any third party network transaction. Participating payees include persons who accept a payment card as payment and third party networks who accept payment from a third party settlement organization in settlement of transactions. A payment card means any card issued pursuant to an agreement or arrangement which provides for standards and mechanisms for settling the transactions. Use of an account number or other indicia associated with a payment card will be treated in the same manner as a payment card.